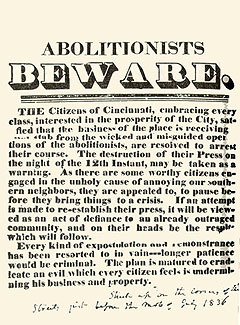 The book “Narrative of the Late Riotous Proceedings Against the Liberty of the Press in Cincinnati” was written in 1836 by the original members of the Southwest Ohio Anti-Slavery Society. In it is wealth of information about the founding of the Anti-Slavery Society as well as the Anti-Abolition Committee. Because Cincinnati was a border town, there were as many pro-slavery citizens as anti-slavery. The book contains letters from both committees as well as newspaper articles leading up to the burning of the Philanthropist newspaper in 1836. 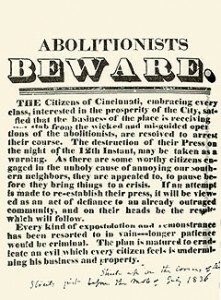 More information on Pro-Slavery Riots in Cincinnati.